Do you dream of having a garage that looks like this photo? I know I do! Houzz is out with a new article and it was written for us. In a nutshell, Houzz recommends breaking the mountain of a task into bite-sized pieces. Be realistic. We are never going to tame our garage beast in one go. We need to break this huge process into a couple of more manageable goals. Do some recon. This is just a look around! Don’t be like me and start moving stuff around. What’s in there? Anything big and bulky? Anything sellable? Just get the lay of the land. Compile a resource list. What are you going to do with everything that you’re offloading? For us locally, I recommend the Moms’ Facebook Group (due to popularity, this group is “secret,” but ping me for an invite if you’re a local mom). Members of the Moms’ group can post items to sell or giveaway on Wednesdays and Saturdays. Westchester also has another local Facebook group where you can post items to give away. If you’re a glutton for punishment, hold a garage sale. If you do, let us know and we’ll put you on the 90045 calendar of events. My personal favorite way to offload items with a little value is to take them over to the Council Thrift Shop in Mar Vista for donation. They will mail you an itemized list of your donations and a generous thrift shop valuation for your taxes. We donate several times each year, although you’d never know it by looking at our garage! Schedule a weekend … or several … and jump in. Okay, that sounds overwhelming by itself. Pick one weekend and see how it goes. Invite a friend for accountability. 🙂 The goal of these weekends is to pull out everything that you’re trashing, donating and giving away. Think about your storage setup. Keeping your stuff accessible as needed and organized is the key to not having to clean out your garage again in three months. Consider overhead storage, wall-mounted storage and locked cabinets. Personally, I’m a big fan of the shelves and plastic bins like the picture above, but the Houzz article has pictures of other solutions that have me drooling. If you go with the bins, have your kids make and print fun pictures (or at least labels) of what’s in the bins to tape to the outside. 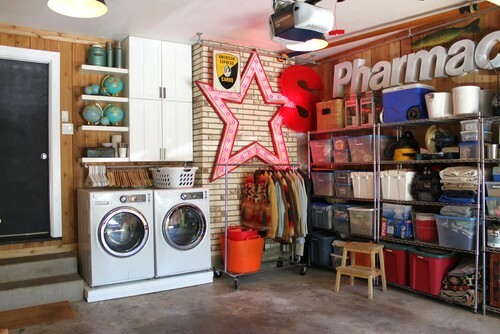 For the full article, head over to Houzz for Garage Cleaning Tips for the Overwhelmed.